At the time of writing, I confess you will need to go to an Italian deli or specialist food outlet for fregola, the sun-dried and toasted Sardinian “couscous” specified for this recipe. I wouldn’t substitute regular couscous for the fregola, which is rather more like dense pasta peas than semolina grains, and thus most comparable to the larger Midde-Eastern or Israeli couscous which could be used in its stead. Soak the clams in a large bowl of cold water, and sort through them, discarding any shells that remain open or are cracked or smashed. Heat the oil in a large heavy-based pan that comes with a lid, then add the chopped shallot, stirring for a minute, grate in the garlic, and add the chilli flakes, stirring again over the heat so that it sizzles, though not long enough to let the garlic brown. Stir in the tomato purée, then add the stock and the vermouth and let it come to the boil. Add the fregola – it should be covered completely by the liquid – and let it simmer, still uncovered, for 10-12 minutes (or as instructed on the fregola packet). 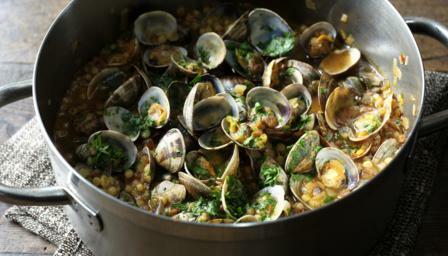 Check that the fregola is nearly ready and then add the drained clams and cover the pan with the lid. Leave to cook for three minutes at a fast simmer, then uncover the pan to check that the clams have opened. Any clams that, once cooked, stay closed should be discarded. Sprinkle in the chopped parsley and stir to let everything combine before ladling into four warmed bowls to serve, sprinkling with a little more chopped parsley as you go.